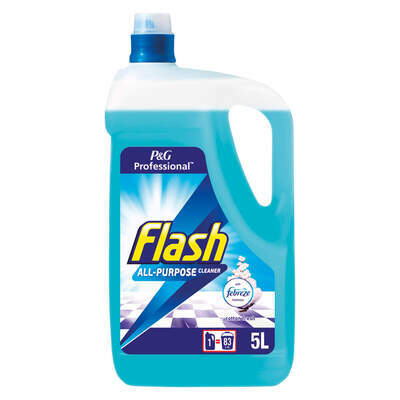 For the freshest and most reliable results, put your trust in this Flash All Purpose Cleaner with Febreze 5ltr. Manufactured by an industry leader, this all cleaning solution can be used both neat and diluted down to tackle stubborn soils. Suitable for a wide range of environments from schools through to care homes, this all purpose cleaner can effectively remove everything from grease through to dirt and tidemarks. With the addition of Febreze, bad odours are quickly neutralized rather than being masked to leave behind an uplifting and inviting fragrance in every room. Don't forget to stock up on brand new Mops and Buckets from our online range to ensure the floors in your workplace sparkle at every turn.